It’s wet, starts with an ‘H’ and lasts for six months. Yes, hurricane season in the Atlantic starts Friday and both the local and national governments are already making a big hoot about it. The New York City Office of Emergency Management has put out a free downloadable brochure called Ready New York: Hurricanes and New York City, available in 11 different languages (making sure no one in the city is mac-less come the rains). As for the National Hurricane Center, not only have they put out a number of You Tube videos and audio recordings preaching hurricane preparedness, but they have also announced that it’s National Hurricane Preparedness Week. Dedicating an entire week to hurricanes is no new thing. Before the creation of National Hurricane Preparedness Week in 2004, there was National Hurricane Awareness Week, but both its name and focus were changed when people realized that being aware of a hurricane is apparently not the same thing as being prepared for one. To further help coastal people prepare this year, the Center has assigned a hurricane-related topic to each day of the week. Yesterday was winds; the day before that was storm surges; and today it’s inland flooding. It turns out that it’s not only coastal communities that are in danger of experiencing floods; even communities that are hundreds of miles away from the coast are at risk. In fact, some of the worst flooding events can occur from weaker storms that drift or stall over an area. The Center’s advice? Get flood insurance. 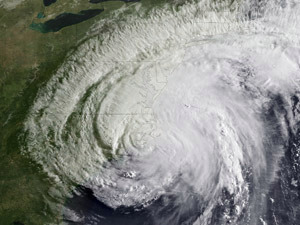 Although last summer’s culprit, Hurricane Irene, did minimal damage (it was downgraded to a tropical storm shortly before reaching New York City), city officials are still urging people to be prepared and ready for what may, or may not, happen this year. Forecasts from the National Oceanic and Atmospheric Administration (NOAA) call for a possibility of nine to 15 storms, four to eight hurricanes, and one to three major hurricanes this season. According to the Office of Emergency Management, August through October are the most likely months for hurricanes and tropical storms in the New York area, but that doesn’t mean that one should put off making preparations until then. Tend to your mother’s advice: you’re better off safe than sorry.